If you are the kind who cannot do without his or her paneer tikkas, naan and dal, then Indiranagar’s new restaurant Urban Tamasha can be an option to eat out with colleagues or fam. Plus, they do Chinese and Continental if you care for that. We should start by telling you that the menu at Urban Tamasha is pretty big and covers north Indian, Chinese and Continental in equal parts. But we would recommend you stick to the North Indian side of things. Though we’d highly recommend the Dragon Chicken from the Chinese section and the lamb chops from the “conti” part. But coming to the North Indian section, start your meal here with the Cream of Broccoli soup served in a bread basket and then move on to the Sunehri Paneer (a spicier and elaborate version of the paneer tikka). The Mango Chill drink we tried came with fresh mango pulp, but the slightly synthetic tasting, sickly sweet syrup at the bottom of the glass was avoidable. The Dahi (hung curd) Kebab was excellent and all kinds of tangy, while we couldn’t stop eating the Dynamite Chicken — old school chilli chicken with lots and lots of green chillies. The starters can be quite heavy duty and portions generous, so save space for the main course. We tried the Dal Bukhara (rich version of the dal makhani), a creamy and mild Veg Dewani handi (a mixed vegetable cooked in cream number) and the Chicken Patiala. The chicken dish was mince wrapped around an egg and then layered with chicken with heavy masala. We found this dish to be too rich and heavy on the stomach, but loved the dal and the vegetarian curry. We also can’t get over the excellent Egg Tadka, a moist mix of kali dal and loads of egg with tomatoes, chillies and coriander. We moped up all of this with rotis and butter naan. We also tried the lamb chops flavoured with rosemary and served with a meaty jus and potato wedges and would recommend it if you are looking to change your taste from all that desi khana. Finish off with the Cream Caramel Custard though Gulab Jamun with ice cream is also an option. 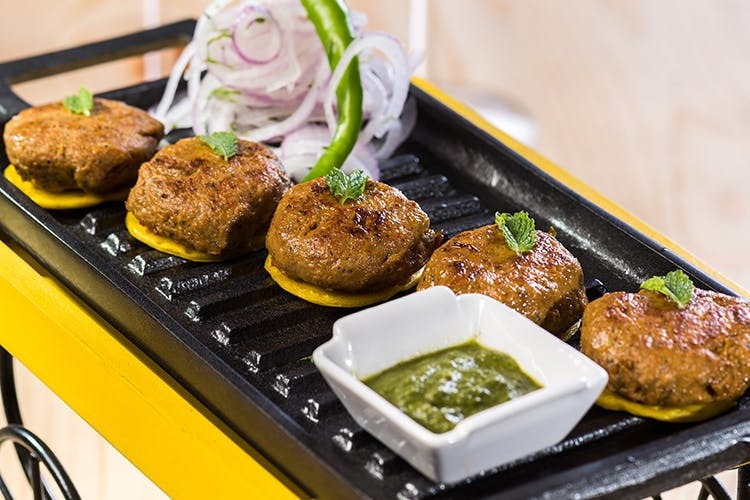 North Indian khana can get a bit much on a regular work day so you might want to save a visit to Urban Tamasha for those days when you are headed for a mega office lunch. They also have a buffet in case you want to try several kinds of dishes at super good price points ( INR 399 plus tax).